Free Tibet - Bye Bye, Pie! Well. Tallulah's DNA results came back. Are ya sittin' down? My girl shows moderate traces of beagle, Tibetan spaniel and American Staffordshire Terrier. Which is a politically correct way of saying "pit bull." 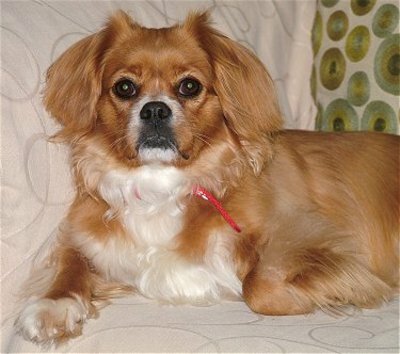 And what the hay is a Tibetan spaniel, you may ask? I certainly did. Tibetan spaniels (see photo, above) have been around for 3,000 years. They were used at Buddhist monasteries to spin the prayer wheels. I am not making this up. They actually ran in the wheels all day for the monks. Energy much? So basically I have a hyper, murderous, yappy dog who roams. And possibly howls. This dog does not have any Lab in her! Have you SEEN my dog? She is Labby Lab girl from Lab town. If she had a job she'd work in a lab. She'd be laborious. She'd walk labyrinths. Beagle, Tibetan spaniel and pit bull. Good gravy. 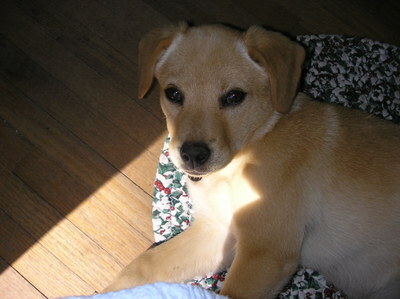 And yes, I know she doesn't have to be a murderous pit bull if I raise her right. Plus also too, she is the least aggressive dog ever, and yesterday I was choking on a drink and she got so scared she peed the floor. So I doubt she will eat my face off any time soon. She is still my girl. Anyway, that is the news. I have so many other things to tell you, namely that I put all my pictures in photo boxes this weekend, and threw away 15 old photo albums. And also too that my friend Sandy and I have decided you don't lose weight running. But right now I am too obsessed with my Tipitgle. Beabull. Spangle. Spitangle. Whatev.